The postcode for our central campus is CV4 7AL. You can use that with route planning services like Google Maps, or with your sat nav to find your way to the University. As you get closer to the area, joining the A45 or A46, there will be signs marked "University of Warwick" to help you find us. 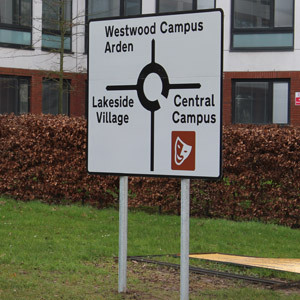 When you reach campus there are signs at all the main roundabouts to each of the major areas of campus: Central campus, Gibbet Hill campus, Westwood campus, Cryfield Village, Lakeside Village and the Science Park. Which part of campus you need to get to depends on who you're visiting. If you've already talked to the department/individual involved, they may well have told you which of these areas to head for. If you're not sure which area, use our online interactive map to search for the building you need to get to and find out which area of campus it's in. Follow the road signs to that area of campus. If you've been invited to campus as a visitor, the person or department who invited you may have reserved a parking space for you. In this case, follow their instructions directly. Otherwise, once you've got to your area of campus, following the parking signs to the nearest car park. Pay and display parking is available at many locations, and the signs will direct you to the nearest one. During the day time, when campus can be very busy, we manage our car parks actively with staff on the ground. Please follow any directions they give you - they're there to help you find somewhere to park. Once you've parked, keep an eye out for our backlit map boxes. 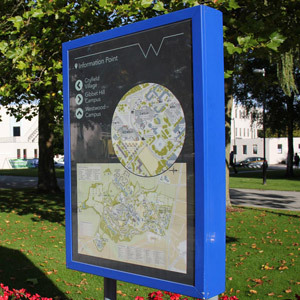 There's one outside every major car park on campus, showing a clear map of the area with building names on. You'll also find interactive totems complete with maps in some places on campus. It may help you to have a printed map too. Given the size of our campus, we've created four printer-friendly maps based on the areas mentioned above.